Our 3rd day was an option day. You could pass on riding and just hit the beach if you wanted, or you could do a shorter ride with Jill, or you could do a longer ride with Chris. A couple folks did the shorter ride but the rest of us went with Chris on the longer ride. The ride was 90K and pretty challenging. We started right at the beach across from the hotel and headed back up the coast road the way we’d come the day before and yes, you guessed it, rode back up the hills we’d come down the day before. It was a thrilling descent the day before and quite the workout to go back up. Great views along the way though. Then the 10K descent on the other side into Llagostera. We just did a quick water stop there this time though and then headed north. I don’t exactly know what towns we went through on the way over, but eventually we crossed over the coastal range again and descended into Platja d’Aro. 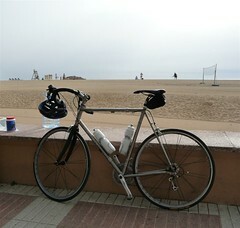 Eventually we wound our way down to the beach and found a cafe to have a snack. 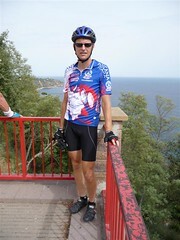 The rest of the ride took us down the coastal road about 25K or so and back into Tossa de Mar. The route hugs the coast with great views along the way. Thankfully, though there’s a fair bit of traffic on this coastal road, the drivers are pretty darn courteous. Moreso than we would expect back home. You just have to keep single file and hold a line near the right side of the road. Dinner was on our own Wednesday night and a few of us took the recommendations of the woman behind the reception desk at the hotel and headed up to Castell Vell. The food was good. I got the ‘Turbo’ (fish) special and some onion soup. I thought this place was over priced though. I didn’t get all that much – fish and soup – and still payed over 30 Euro. That’s about $45 for the folks back home. The picture below is of the beach at dusk not far from where we had dinner. 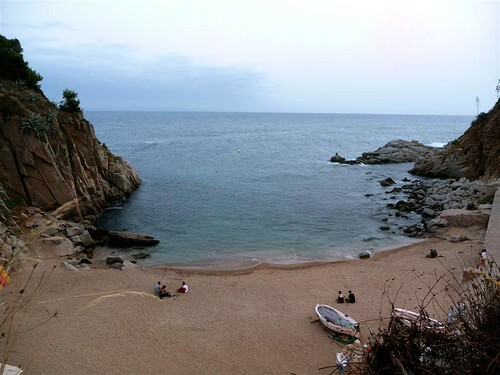 Next up… on to Calella.